This coconut whipped cream is delightful! It’s thick, smooth, and creamy, just like the original. It’s the perfect topping on a slice of pie, golden milk latte, hot cocoa, pancakes, waffles, ice cream, and a variety of other homemade desserts and beverages. 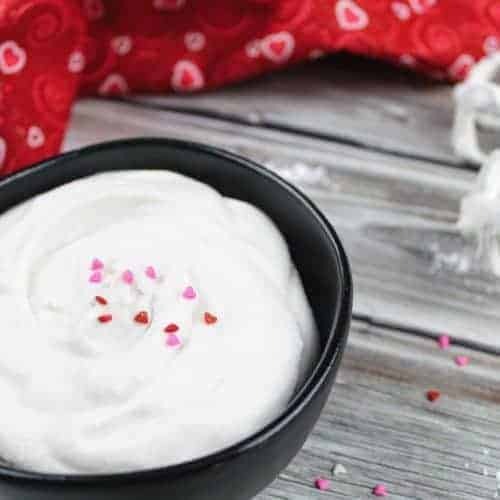 Coconut whipped cream is a great alternative to regular homemade whipped cream for those that are vegan or dairy-free. It’s also a great alternative for people like me who aren’t strictly dairy-free, but want to watch and minimize their intake. 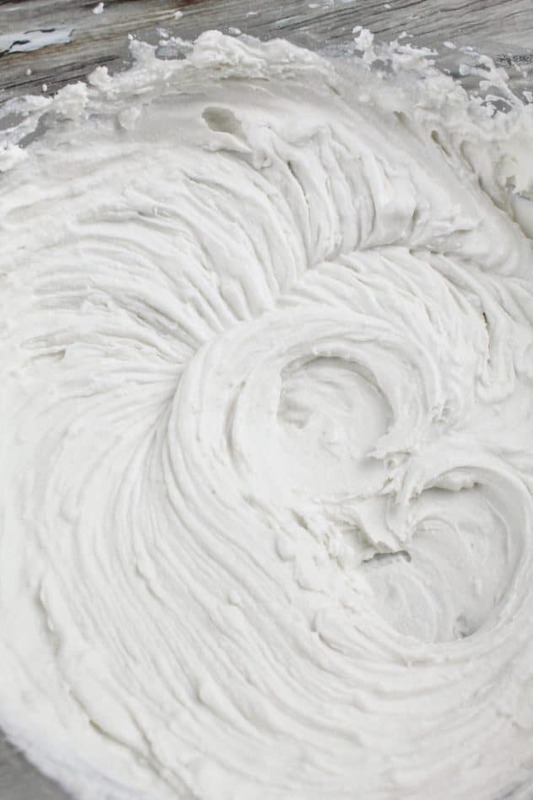 This coconut whipped cream takes less than 5 minutes to make and contains only 3 ingredients. You can also pipe it into different shapes and also freeze it for later use! How do you thicken coconut whipped cream? The best ways to thicken coconut cream are with additional confectioner’s sugar and/or with tapioca starch. I lean more towards the tapioca starch, because I prefer my coconut whipped cream on the less sugary side. What does coconut cream taste like? Coconut cream, from which coconut whipped cream is made from, has a slightly denser feel than regular homemade whipped cream and has a pleasant coconut taste. The taste itself is not overwhelmingly coconut, so it will pair well with a lot of other flavors. 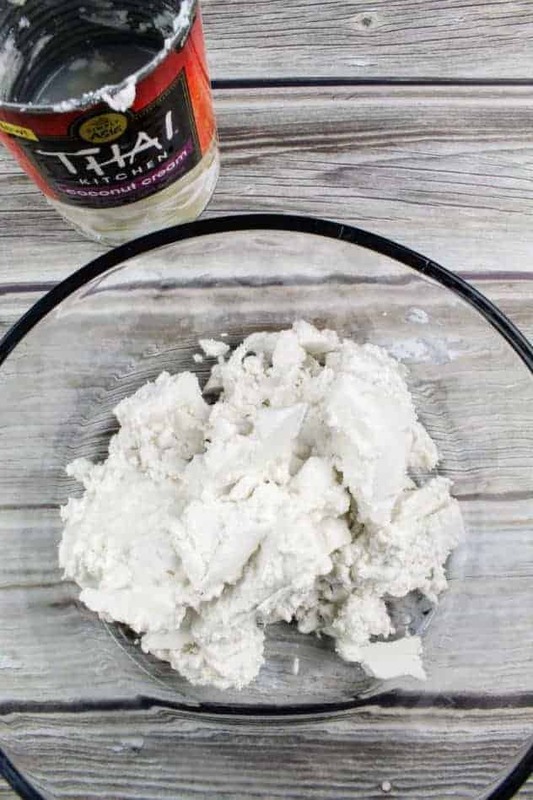 The main difference is that coconut milk has the consistency of cow’s milk whereas coconut cream is much thicker (because of a lower water content). If you refrigerate a can of coconut milk overnight in the refrigerator and then open it, you would get coconut cream on the top and liquid on the bottom. The coconut cream at the top can actually be used to make coconut whipped cream. However, I prefer to use coconut cream to make coconut whipped cream because you get more cream to work with. It’s also worth noting that there is also cream of coconut. Cream of coconut is just a sweetened version of coconut cream. Because of the added sugar, you cannot simply interchange it with coconut cream. 1. Place a can of coconut cream in the refrigerator to chill overnight or for at least 3 hours. Once it’s chilled, open up the can. Scoop out only the solid part at the top of the can into a mixing bowl. Reserve the liquid at the bottom for use in other recipes. 2. Using an electric mixer, beat the coconut on medium speed until it starts to look like regular whip cream (about 1 minute). 3. Add in the confectioner’s sugar and the vanilla extract. 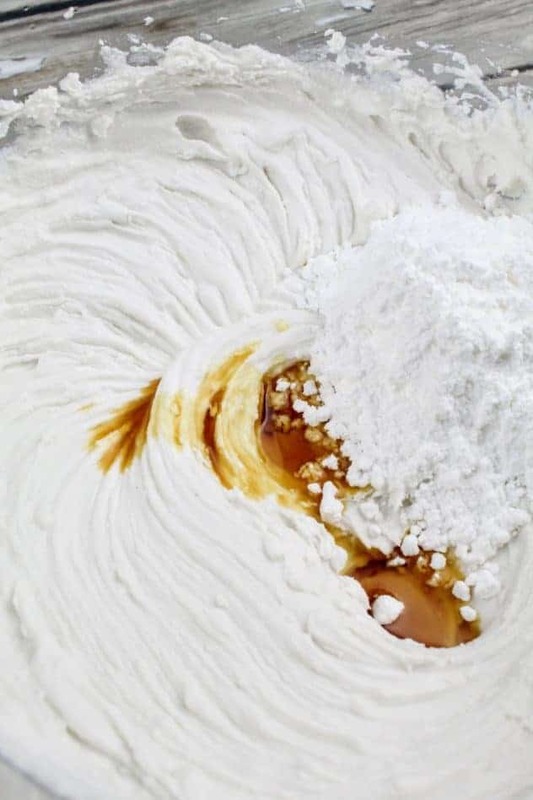 Using an electric mixer, beat on low to incorporate sugar and vanilla (a few seconds) and then increase the speed to high to whip the coconut cream (about 1-2 minutes). Taste test. If you would like it a little sweeter, add in additional sugar and beat on low to mix it in. Repeat process until desired sweetness is achieved. 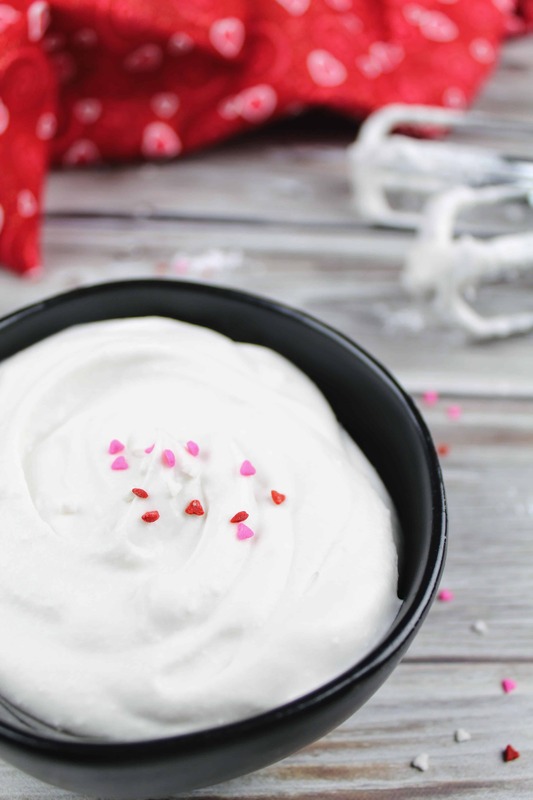 This coconut whipped cream can be used to top pie slices, hot chocolate, pancakes, waffles, ice cream, or used in a fruit salad! Place a can of coconut cream in the refrigerator to chill overnight or for at least 3 hours. Once it's chilled, open up the can. Scoop out only the solid part at the top of the can into a mixing bowl. Reserve the liquid at the bottom for use in other recipes. Using an electric mixer, beat the coconut on medium speed until it starts to look like regular whip cream (about 1 minute). Add in the confectioner's sugar and the vanilla extract. Using an electric mixer, beat on low to incorporate sugar and vanilla (a few seconds) and then increase the speed to high to whip the coconut cream (about 1-2 minutes). 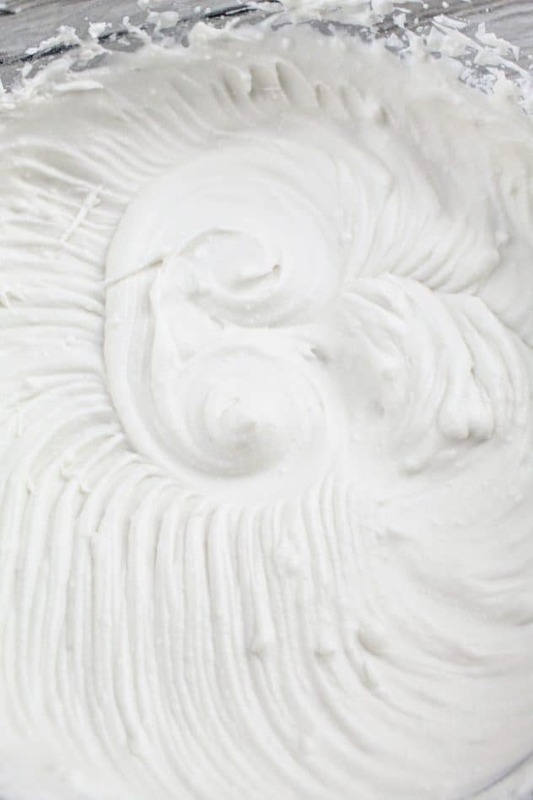 To freeze: On a wax paper lined baking tray, either pipe swirls or scoop dollops of the coconut whipped cream. Place in the freezer for two hours or until frozen. Remove coconut whipped cream dollops from wax paper and transfer to a labeled quart size freezer bag.